The use of off-road vehicles (ORVs) is a long-standing way for visitors to enjoy the Seashore’s ocean beaches and soundside waters. To provide for both visitor enjoyment and the protection of park resources, please observe the following regulations and recommendations when using ORVs at the Seashore. For more information, please visit NPS Current Interactive Beach Access Map using Google Earth. 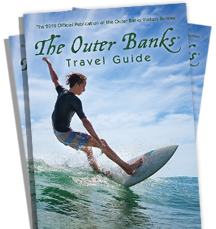 For current Cape Hatteras National Seashore Off Road Vehicle (ORV) use, please click here. For current Nags Head Off Road Vehicle (ORV) use, please click here. For current Kill Devil Hills Off Road Vehicle (ORV) use, please click here. * Any law applicable to vehicle use on paved roads in the State of North Carolina also applies to ORV use at the Seashore. A current driver&apos;s license, valid vehicle registration, insurance and license plates are required for all vehicles. * Check with local tackle shops concerning fishing license requirements and size and creel limits for various species of fish. * Proceed with due caution and consideration for other beach users. Pedestrians always have the right of way. Please be especially cautious of children and pets who may dart into traffic. Watch for fishing lines. * Drive slowly and be alert for people lying, standing or walking on the beach. * Use of a Four Wheel Drive (4WD) vehicle to drive on the beach is highly recommended. * Lower the pressure on all tires. The softer the sand the lower the pressure needed. Generally drive with 20-25 lbs. pressure in the tires. When you return to paved roads, inflate the tires to normal as soon as possible. * When possible, drive on the portion of the beach located just below the high tide mark. Avoid getting too close to the water. Before driving through any water, determine the depth and firmness of the underlying surface. * Drive at a slow and steady speed. Speed limited on park beaches is 15 mph, unless otherwise posted. If the tires start to spin, back up in your tire tracks for several car lengths. Accelerate slowly as you move forward. Additional tire deflation may be necessary. * Salt water spray is highly corrosive. It is recommended that you wash the vehicle after each outing, both sheet metal and undercarriage. * Park Rangers may assist you, but they are not permitted to pull or tow other vehicles. Commercial towing services are available. * Do not litter. Please deposit all trash in trash containers wherever available or by bagging and removing it from the beach. Please avoid littering the beach with dead bait, carcasses or other dead fish of any kind. * Avoid overcrowding any one area and displacing others from their previously chosen spots. * When parked on the beach, leave room for two-way traffic to pass safely. Park along the shoreline in a single row of vehicles no more than one vehicle deep. * Refill holes and remove any boards or other aids after being stuck, leaving the beach passable for others. * Observe common courtesy on the beach and the rules of the road when meeting or passing other vehicles at constricted areas. * Remember at all times that the unspoiled beaches of all seashore areas afford the pleasure to everyone. It is incumbent upon each of us to preserve this natural heritage. * Enter and leave beach ONLY at designated numbered ramps. * Avoid driving or parking on the wrack line. The wrack line is a line of stranded natural debris on the beach left by the previous high tide that can be an important food source for protected birds. * Observe posted closures. Violators are subjected to a fine of up to $5,000 and/or imprisonment up to 6 months. * Night Driving: During the sea turtle nesting season, from May 1 to November 15, driving on the Seashore&apos;s beaches is prohibited from 9 p.m. to 7 a.m. Some portions of designated ORV routes may reopen to night driving on September 15 if there are no turtle nests in the area. Contact the park or check the website for permit information. November 16 to April 30 night driving is allowed. * Pets must be on a 6-foot leash at all times. Pets are prohibited within any bird closure. They can disturb nesting adults, kill chicks or crush eggs. * Beach fires are permitted with a free beach fire permit from May 1 to November 15 only on the ocean beaches in front of Coquina Beach; the villages of Rodanthe, Salvo, Waves, Avon, Buxton, Frisco and Hatteras; and the Ocracoke Day Use Area. Fires are prohibited from 10 p.m. to 6 a.m. year-round. Beach fires are permitted from November 16 to April 30 on Seashore&apos;s beaches with the free beach permit. Beach Fires may be ignited and maintained seaward of the ocean dune below the high tide mark, but in no case less than 50 feet from a vegetated area and fires must not be built within any resource closure or within 328 feet (100 meters) of any turtle nest closure. All fires must be no greater then 3 feet in diameter. The use of non-wood products or wood products containing non-wood items (glass, plastics, cans) for fire construction is prohibited. No beach fires are allowed in posted bird or turtle nest protection areas. * Remove ANY trash or litter from the beach, including bait, fish parts or dead fish. Trash attracts predators. * Feeding wildlife (Including Gulls) is prohibited. Human food is unhealthy for wildlife and may create a harmful dependence on humans for survival. Feeding may artificially inflate animal populations, create aggressive behavior and force other species out of habitat. * Kite flying and frisbee tossing are prohibited within or above any bird closure. Kites and frisbees can scare birds off their nests, leaving eggs and chicks exposed to predators and deadly heat. * Fireworks and metal detectors are not permitted. * Jet Skis and other motorized personal watercraft are not allowed. * Return all fish not being kept back to the water alive, including skates and sharks. * Camp ONLY in designated campgrounds, not on the beaches. * Do not dump wastewater or graywater on the beach. Please use park dump stations for this purpose. Portions of the beach may be temporarily closed to ORVs due to mandated protection of wildlife and plant species, such as protected birds and sea turtles. Closure boundaries may shrink or expand given the specific behavior or requirements of protected wildlife. In addition, certain areas of beach may be closed due to seasonal pedestrian use or if the beach is too narrow for safe driving. Alternative routes of bypasses may be established if possible. For current information, visit one of the seashore visitor centers or www.nps.gov/caha. * Drive Only On Marked ORV Routes And Comply With Posted Restrictions. Do not drive on or between the dunes. Driving or parking on vegetation is prohibited. * Observe Posted Speed Limits. The speed limit on park beaches is 15 mph unless otherwise posted. * Any Law Applicable To Vehicle Use on a paved road in the State of North Carolina also applies to ORV use. * A current driver’s license, valid vehicle registration, insurance and license plate are required for all vehicles – including ATVs. • Reckless Driving (ie: cutting circles or defacing the beach) is prohibited. * Avoid driving or parking on the wrack line. The wrack line is a line of stranded natural debris on the beach left by a previous high tide that can be an important food source for birds. * Pedestrians ALWAYS have the right-of-way. * Open containers of any type of alcoholic beverage are prohibited in vehicles. Public consumption of spirituous liquors or fortified wines is prohibited. * The use of seatbelts is required. * Do not hang out of moving vehicles or sit on the tailgate or roof. Those in truck beds must be seated on the floor with the tailgate closed. Children in truck beds must be accompanied by an adult. Check the weather forecast and tide tables before starting your trip. ASK A PARK RANGER ABOUT CURRENT BEACH CONDITIONS/CLOSURES.